Neverout is Gear VR’s version of the movie Cube. If you haven’t seen Cube, it’s a movie where people wake up trapped inside of a large cube-shaped room and have to figure out puzzles and traps to escape into the next cube-shaped room, where a new set of puzzles and traps lay. In Neverout, you start inside a cube-shaped room. 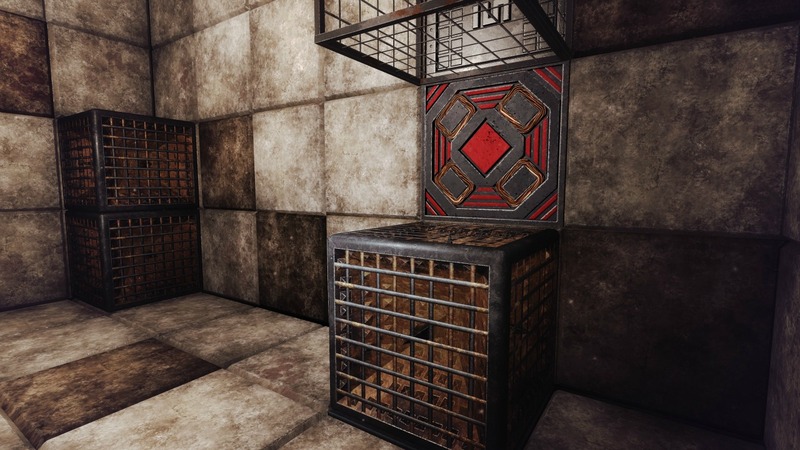 There is a visible hatch in the room that you must navigate to and then slide down through it into the next cube. With each cube you are in, there is a navigational puzzle you must solve to progress to the next cube-shaped room. Overall, the game is fun and I definitely like the idea of the game. I enjoyed the movie and I feel the concept transitions well into a similar VR puzzle game. Each cube-shaped room is made up of square tiles. You move around the room by moving one square at a time. You can walk across the room and onto the walls and ceilings as well. When you walk onto a wall, the room rotates so you keep the same perspective and gravity is always directed toward whatever is down. This comes into play in later levels. 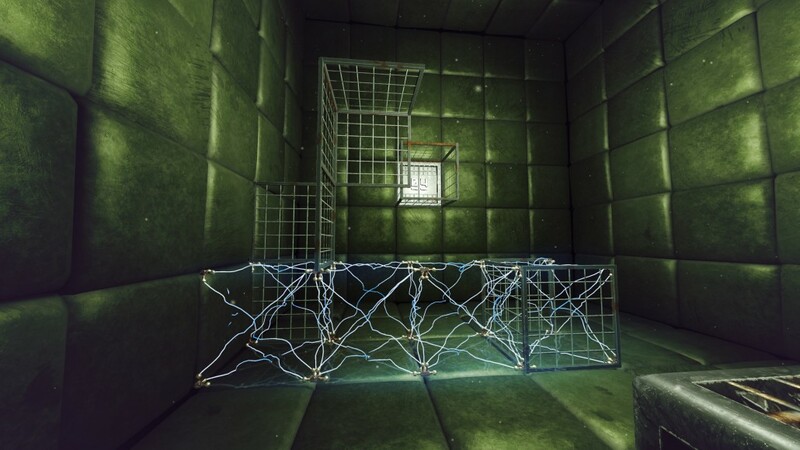 The navigational puzzles include box obstructions in your path, electrical currents, fences you climb and drop off of, as well as spiked crates that fall as gravity in the room shifts. Neverout is another game that is easy to just pick up and start playing for a while. There also seems to be a good amount of content compared to other VR games as there appears to be about 100 - 120 rooms to discover and solve. On one hand, the puzzles are pretty easy to solve, at least in the beginning. However, I can see how that is a good thing as being stuck for too long in the same room could quickly turn people off from continuing to play the game. This is also another game that is easy on the stomach due to lateral only movements. There are no curved or rotating movements to make you queasy. 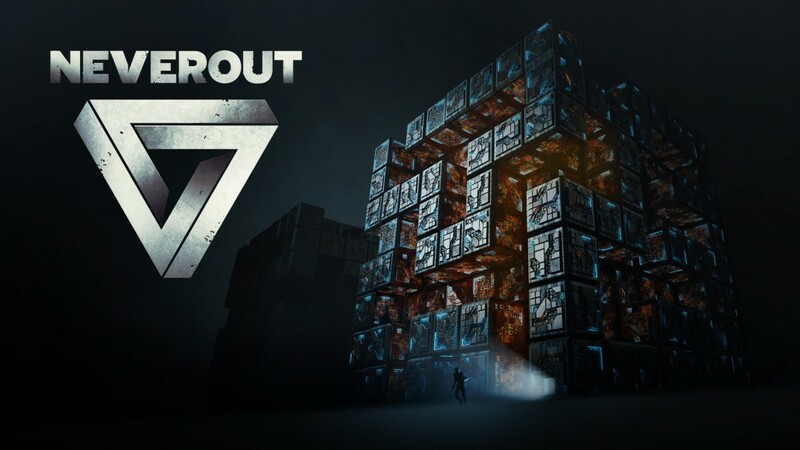 Neverout is a good game for people who like to solve quick puzzles and explore new rooms, while also having several hours of content to play with. tto say that this write-up very forced me tto try and do so!